Pensacola, Florida (CNN) -- When you're on vacation or live in a coastal community, it's a symbol you simply don't want to see: a no-swimming sign, along with a beach health advisory. Surrounded by hundreds of BP cleanup workers wearing protective suits in the sweltering heat, Crist toured the area by helicopter and on foot, and he thanked workers for their efforts. "Its like Jimmy Buffett said, we don't want to take the 'sky is falling' attitude about this," he said of the musician and coastal activist. "We want to see it, we want to address it, we want to clean it up and stay after it and stay after it and stay after it. ... It's the attitude we have to take," he said. 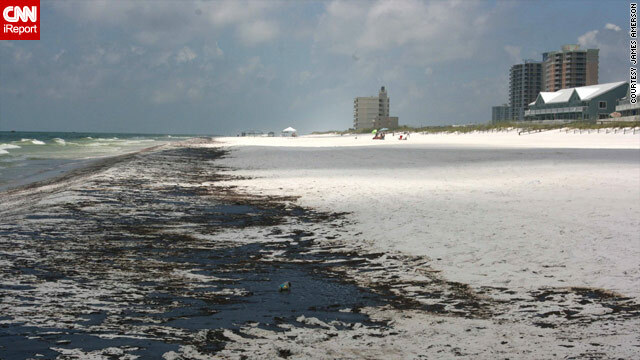 Oil also washed up on nearby Perdido Key, where workers cleaned up 8 tons of tar balls. Offshore, several shrimp boat skimmers could be seen fairly close to shore, near the Pier at Casino Beach. "You've got a lot more aggressive work skimming now," said Florida Department of Environmental Protection Secretary Mike Sole. "There's more skimmers coming in to be able to keep it offshore, so I'm hoping they will be able to go ahead and continue that robust effort offshore so that we only see very little onshore." But to continue the fight against oil, Florida's Gulf counties say they need money, and they say BP isn't returning phone calls. County representatives are meeting Wednesday with the U.S. Coast Guard and BP to make sure the checks get in the mail. "We've got to force them to and make them do it," Crist said. "We're just going to keep asking and asking and asking."